Remember that whole Atlanta street food movement that was kind of an underwhelming blip on the food radar? Food trucks would set up shop in parking lots as a joint festival celebration of "street food." Well now there are two true street food vendors in Poncey Highland that are far outshining the food truck competition. Both of these new stands make simple, comforting classics and they do it far better than anyone else. The first street vendor that's really doing things right is Hector Santiago (Pura Vida and Superpan). His El Burro Pollo is crushing the likes of Willy's and Moes and frankly, doesn't deserve to be used in the same sentence as the California burrito chains. Every weekend Hector sets up shop in the parking lot at the corner of N. Highland and Blue Ridge Ave (across from the old San Francisco Coffee lot). 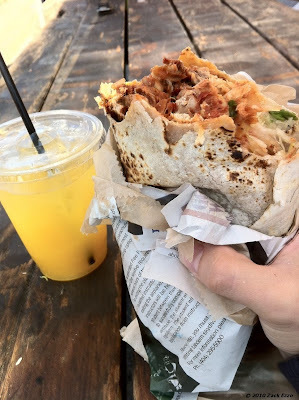 Hector makes the most magnificent burritos in all the land and combines a heaping portion of lightly spiced and shredded chicken with fresh, cool and crispy vegetables which will leave you full for the afternoon. El Burro Pollo even goes the distance by grilling the tortillas prior to assemblage. An enormous burrito will only set you back $6 and a veriety of latino beverages are offered for $2 each. Go hungry. Less than 100 feet south on Highland (next to the Highland Inn) is an even newer entrant into the street food realm - ATLFRYGUY. Serving belgium style frites (fries), ATLFRYGUY cooks to order and seasons these fresh, crispy yet fluffy numbers immediately after removing from the frier. A wealth of sauces are offered and an order will set you back 5 delicious dollars. Don't hesitate to make a grand lunch of it combining the frites with the burros. If you want to top it off with some dessert, just stop in at King of Pops, further south on N. highland in the Buddy's Parking lot. PS - Since the onslaught of cooler weather is in full swing, El Burro Pollo has been moved inside Superpan on Blueridge. Hours are approximately 12-3. I would say Poncey Highland, not VaHi.